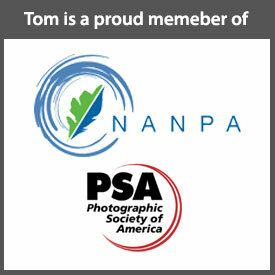 Yesterday, I wanted to get the new year off to a good start, photographically. Despite a generally dismal day weather wise I did get out with my camera. The sky in this image, after some work in Lightroom and Photoshop, is too blue and therefore too “cheery” for my image of a cold New Year’s Day with a bright year ahead. Converted to black and white it became dreary, not just cold. And, the sky foreboding rather than optimistic. When I’ve had the opportunity recently my intent has been to really pay attention to creating images that are expressive, sharing what it was like to me while I was experiencing the landscape around me. This demands that I take more time. Since my objective is to produce an image that tells the story of what I’m experiencing, I need to look at my subject more intently, taking time to contemplate what it really is I want to photograph. I come home with far fewer images, but I like the results more. The photos here are yesterday’s effort. 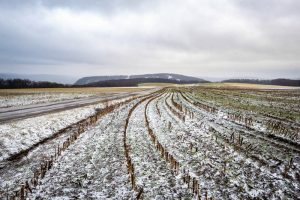 I was driving around the countryside near my home for a of couple hours this New Year’s Day before I came up on a long since harvested corn field open to the cold winter wind, with a light trace of snow. I’d found a subject that had meaning for me. I actually like the coldness in this black and white conversion. Still, I think the black and white sky is more foreboding than hopeful. I like the slight tint of blue in this sky. It still emphasizes the coldness of the day but allows a suggestion of better days to come. Even before I could get out of my car I knew my subject wasn’t the cornfield, per se. At first it was the coldness of this particular New Year’s Day. I walked up and down the icy, dirt tractor-way and ventured into the corn fields on both sides of it. 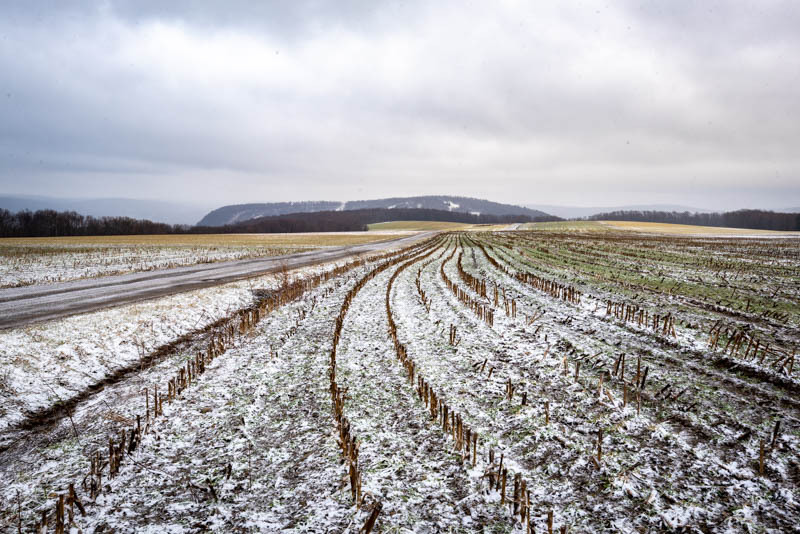 Experiencing the cold wind penetrating my layered clothing, I found myself looking for a way to compose an image that would feature the coldness of this hill-top cornfield. 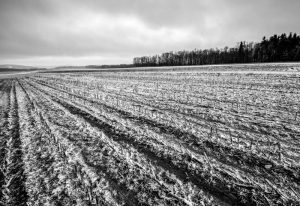 I determined to use the clipped rows of corn stalks as well as the dirt road to lead my eye to a cold, cloudy sky above the distant horizon. As the cold wind nipped at my finger tips I experimented with a few compositions (portrait & landscape). I had decided my subject was the cold and both the light sprinkling of snow on the corn field and the cloud-filled sky were part of that story. The image would feature the light dusting of snow between the long rows and those same rows would lead my eye to the cold, cloud-filled horizon. The sky featured a faint hint of blue, in my mind signaling a brighter tomorrow. That was a good thought for New Year’s Day 2019. Back home with the downloaded images I spent a few moments tweaking them to better communicate my story, that had become about a cold New Year’s day in the country, as I look forward to brighter days of the new year. 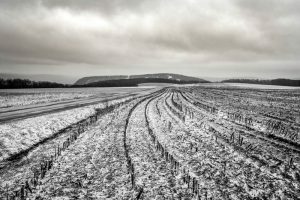 I experimented converting my images to black and white in search of more of the feeling of the cold I had experienced. The conversions, however, lost the blue in the sky that was about the future. Indeed, one color rendition, tweaked in Lightroom and Photoshop, turned out too blue and seemed to loose the feel of the cold. I’m looking forward to the ADK High Peaks Winter Photography Event coming up the end of this month and the first few days of February. 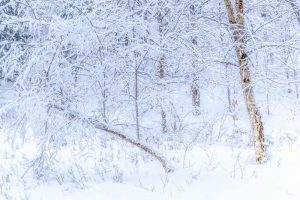 Click here (2019 ADK High Peaks Winter Photography Event) or on the photo above/left for more information and to register for this event.